Ultra Tour de Mont Blanc. - Nicky is round in 32hrs 32mins 11 secs, she'll have to let us know how this stands in her category. UK runners results. Next year it's on 2nd September in Slovakia 145km NE of Bratislava. Details are emerging of the FRA Relays this year, at Luss, Loch Lomond. Maps for Legs 1, 3 and 4. We have entered :- two Senior Men teams, MV40, MV50, Senior Ladies, LV40. Maybe we won't finally be allowed all these teams, and the category of the teams can be altered. As ever, if you want to be considered, it's up to you to contact Captains, not their job to be prattling around asking. That would be Rob and Helen. For the MV50 it has traditionally been Keith, and will be this year. Nobody has come forwards about a V60 team, so that idea was scrapped. For the Hodgson Brothers Relay (to give it it's Sunday name) , we have the usual Men, Ladies, and MVets. Lakeland Classics :- results so far. The team is 3rd, after Borrowdale and Ambleside. Not that far back, and just Three Shires remaining, as Langdale isn't a counter this time round. Mike is 10th, Dave Lund - 11th, Keith - 1st V60. The Ladies are high up, as might be expected. Judith - 1st : Nicky - 3rd and 2nd V40 : Jenny - 3rd V40. England Home International Trial:- results. I'm not knowing much about this, sorry! But Eve Crownshaw is 4th, in 22.51 , and Jack is 14th, in 43.27. Pendleton:- a most pleasant AS race, up and over that far end of Pendle Hill. just simple, unfussy fell running, with a good bit of everything along the route. Then sit in the stream and wash all the muck off. Results. 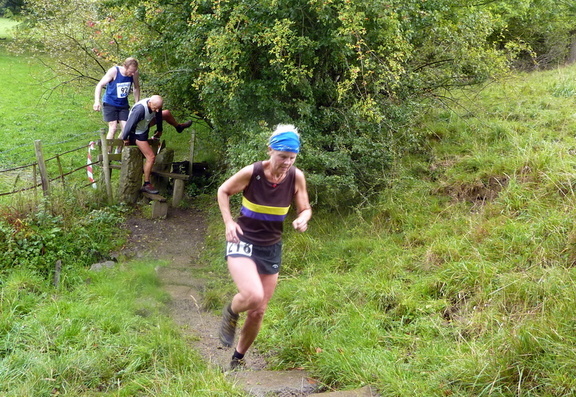 RAB Mini-MM - Round 3 - from Braithwaite:- results. Reeth Show - BOFRA - results.